Here’s something you’ll notice at a cyclist’s home. They’ve their own set of bicycle tools. When it comes to bicycle repair and maintenance, you don’t always need to send your bike to the mechanic. Sometimes, you’ll be better off doing it yourself at home. There are many videos on Youtube to guide you through if you’re new to these. If you’re new, you might want to consider getting individual bike tools to perform basic tasks such as replacing the cassette/chain and adjusting the brakes or derailleurs. 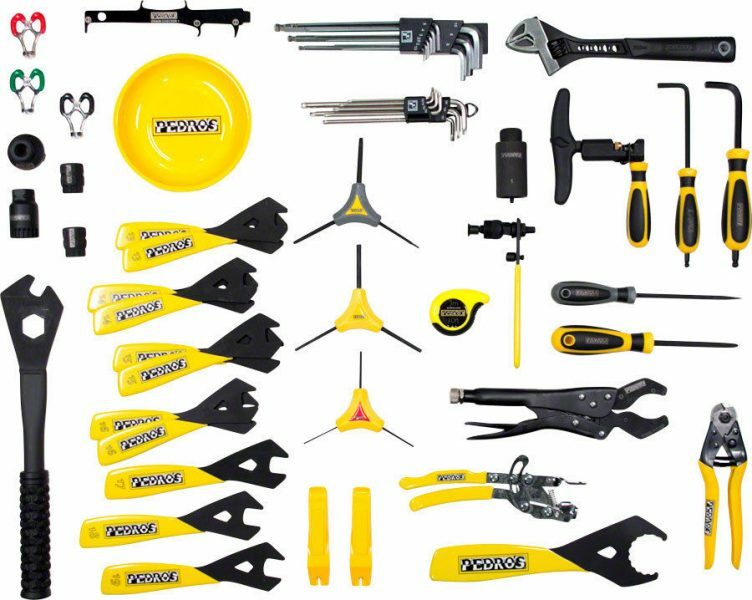 But if you’re very handy with the wrenches and have good bike repair knowledge, then you might want to consider getting a complete bike tool kit. Here are some of the best bike tool kits you can consider. Bikehand is a Taiwanese bike tools brand which dates back to 1988. 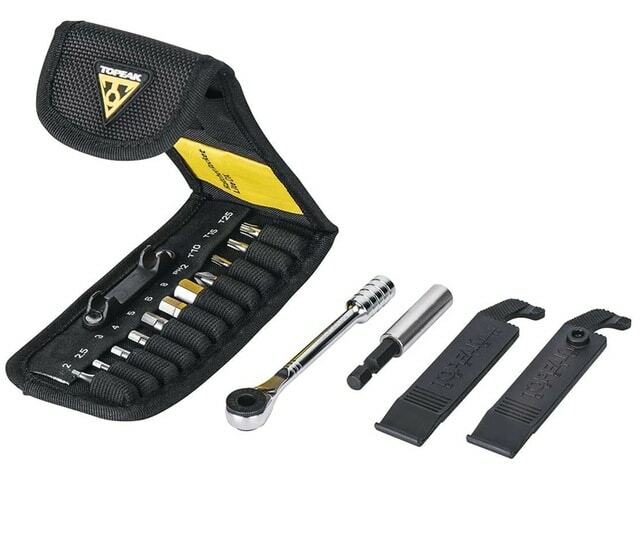 They manufacture some of the best value for money bike tools and this tool kit is one of them. It’s perfectly suited for the occasional home mechanic. 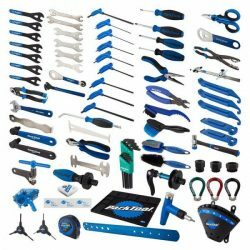 It comes with quite an extensive range of repair tools for almost everything you need for basic repair and maintenance jobs at home. It’s good for assembling new big box store bikes or performing basic maintenance on both kids and adult bikes, regardless whether it’s a road bike, commuter bike or mountain bike. There are tools for you to work on the tires, brakes, bottom brackets, pedals, chain and cassette. As a bonus, this tool set comes with a hard plastic case with dedicated compartments to organize all the tools so you don’t misplace them. 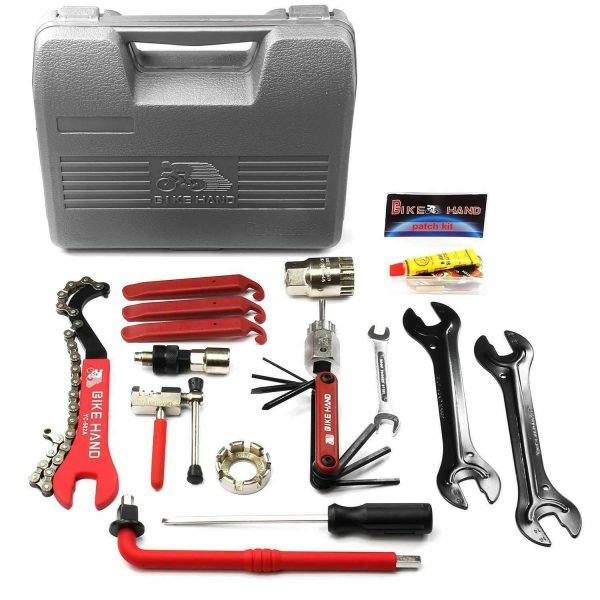 If you’ve started to explore being a home bike mechanic, the Bikehand Tool Kit is a great starting point with its affordable pricing. 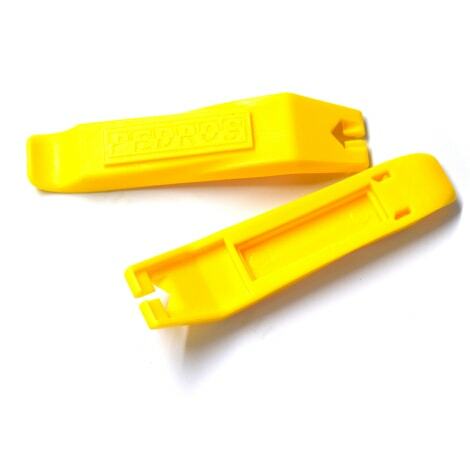 Topeak is an established brand in bike accessories and tools. Their product lineup consists of everything ranging from bike tools to pumps to bags and lights. 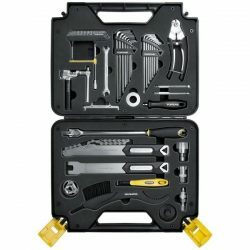 Opening up the carry box, you’ll find 18 sets of tools capable of performing all intermediate bike repair and maintenance tasks such as chain and cassette replacement, pedal removal, adjusting the brake, brake pads and derailleurs. These tools are of shop quality; made from hardened steel which will last you many years down the road. The carry bag made of hard polymer makes it easy to store and carry the tools around. If you’re looking for a high quality tool set that’s compact and mobile enough for you can carry around, then this is a good option to consider. Pedro is a specialist brand when it comes to bike tools. They’ve been around since 1989 and their bike tools have had raving review from cyclists and mechanics all around the world. 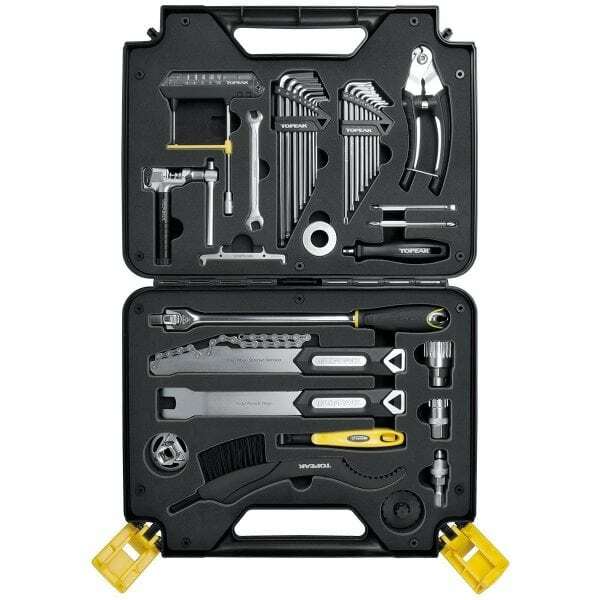 The Pedro Apprentice Bench Tool Kit is for those who have intermediate to advanced bike maintenance and repair skills. It’s a step below the Master Tool Kit which has the most extensive range of tools in Pedro’s lineup. But don’t be fooled by its Apprentice description, this tool kit packs a lot of functionalities in it. 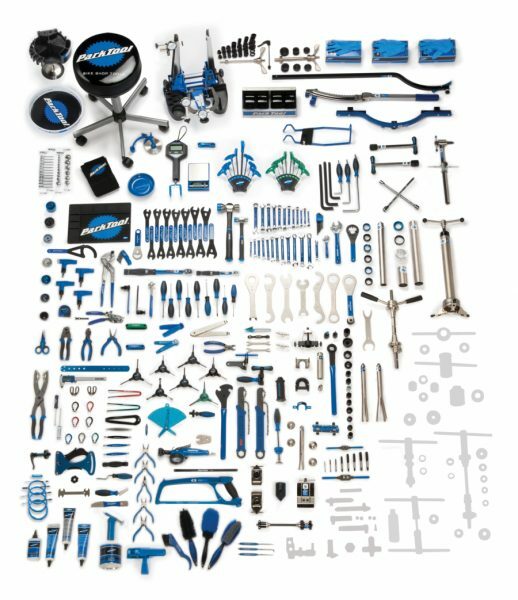 There are 55 pieces of professional quality bike tools which will get you through all bike build, strip, repair and maintenance tasks without needing any additional tools. If you’re good with the wrenches but doesn’t want to spend a bomb on a bike repair tool kit, then this could be a worthwhile investment. 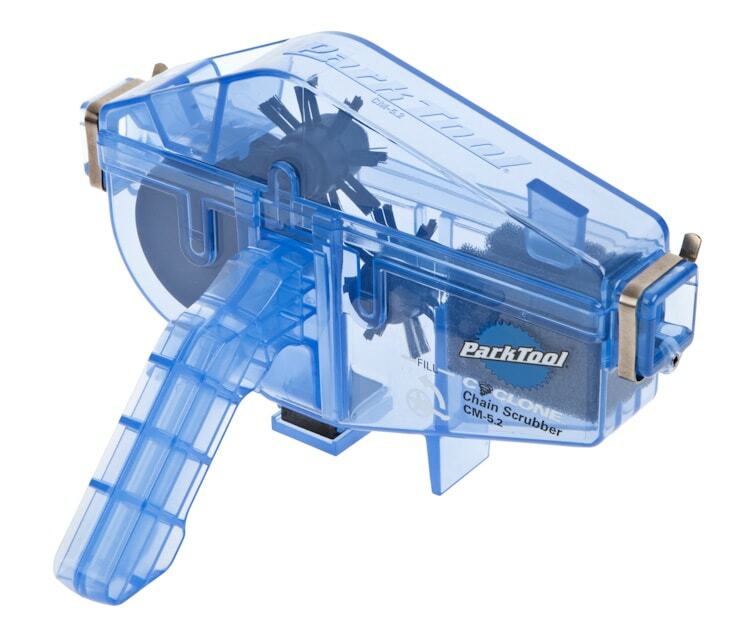 Park Tool is the household name when it comes to bike tool. The name itself screams pro and high quality. Walk into any of your local bike shops and chances are you’ll see Park Tool in their workshop. 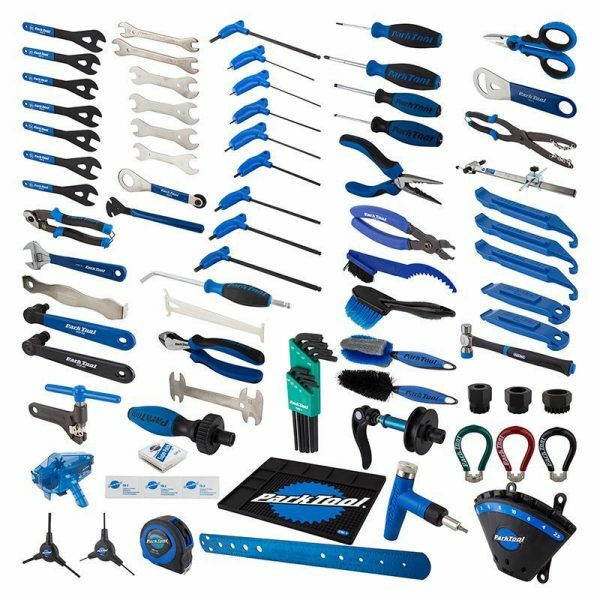 The PK-3 is Park Tool’s professional range of tool set with over 70 different sets of tools available. These extensive range of tools will get you through most of the advanced bike repair and maintenance tasks on all types of bikes. It even comes with the Cyclone Chain Scrubber, which is a nice bonus. In my opinion, it’s the best and most effective chain cleaner around. Best of all, all these tools can be stored in a carry box, which is about the size of your average tool box in the garage. So, if you’re after the highest quality and extensive range of bike tools, look no further than this one. If you see your local bike shop’s workshop having a big white wall with all the tools arranged in order, chances are they’re the Park Tool BMK-264 tool set. This is the mother of all bike repair kits. It has everything that you need for a bike workshop. Period. There are cone wrenches of various sizes, Torx keys, Allen keys, chain splitter, spoke wrenches, cable cutter, fixtures and fittings, chain lubes, gauges and various accessories to go with it. In short, they’ll definitely make your workshop look like a professional. But having said that, the quality and quantity of the tools available need to be backed up with the skills and knowledge to use them correctly. Make no mistake, it does come with a hefty price tag. But with the extensive range of tools available and their quality, it’s a worthwhile investment especially if you’re setting up your own bike workshop. There are times when you only need a selected few tools to perform the most basic maintenance jobs and having a complete tool kit could be an overkill. So, here are top 11 bike tools that would be very useful to have at home. 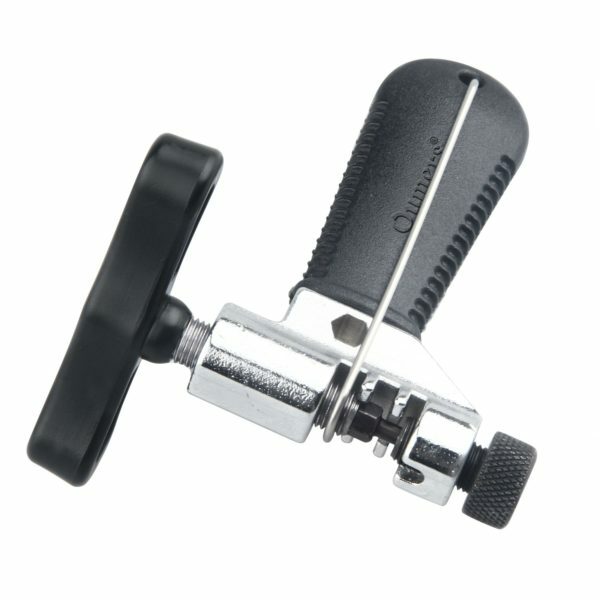 The Pedro’s tire levers will definitely help you to quickly remove tight and stubborn bike tires from the wheels without needing excessive force and effort. They work in pairs, so don’t lose them one of them or you’ll have a hard time removing the tires by the roadside. Remember to have one pair stored in your saddle bag as well. 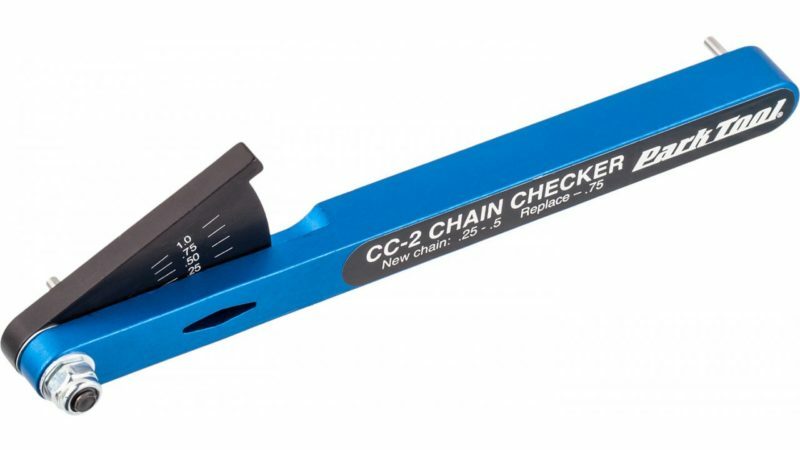 This tool measures the chain’s stretch and more importantly, it lets you know when it’s time for a new chain. All chain manufacturers suggest it’s time for a new chain when the chain wear indicator falls between 0.50 or 0.75. Don’t wait until it shows 1.0. That’ll be too late. A worn out chain will quickly wear out other parts of the drivetrain such as the cassette and chainrings. 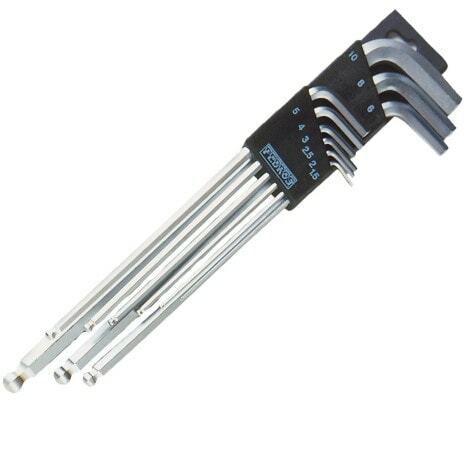 A set of top quality L-shaped hex wrench from very reputable brand, Pedro which has all the sizes you’ll need for your bike. There are 9 of them, ranging from 1.5, 2, 2.5, 3, 4, 5, 6, 8 to 10mm in size. A plastic holder is included so you don’t lose them. The L-shaped and a ball-end design allow for greater leverage and easier access to hex sockets around tight spots. 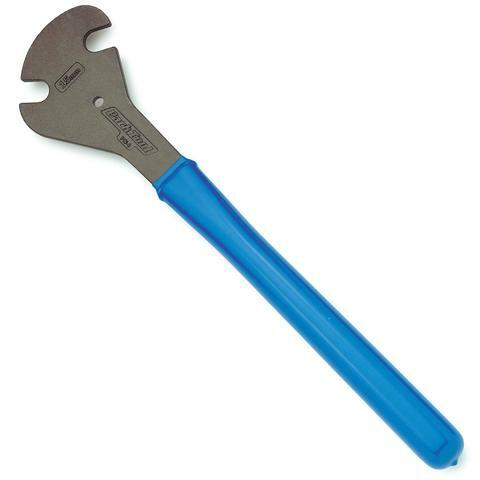 This is a mini ratchet tool that allows you to loosen and tighten nuts at hard to access places. It comes with 7 allen key sizes, ranging from size 2, 2.5, 3, 4, 5, 6 to 8mm, 2 Torx keys of T10, T25 and a Phillips screwdriver head. A pair of tire levers are also included as an extra bonus. A torque wrench prevents you from tightening nuts more than the manufacturers’ recommended torque values. Nothing is worse than over tightening nuts on carbon and then cracking it unintentionally. It has a user-adjustable torque range between 2 to 24nm, which covers all you need for the bike from stem to bottom bracket bolts. When it reaches the pre-set torque value, it has an audible click sound. You can easily swap out the bike cassette at home and save a trip to your local bike shop with this tool. 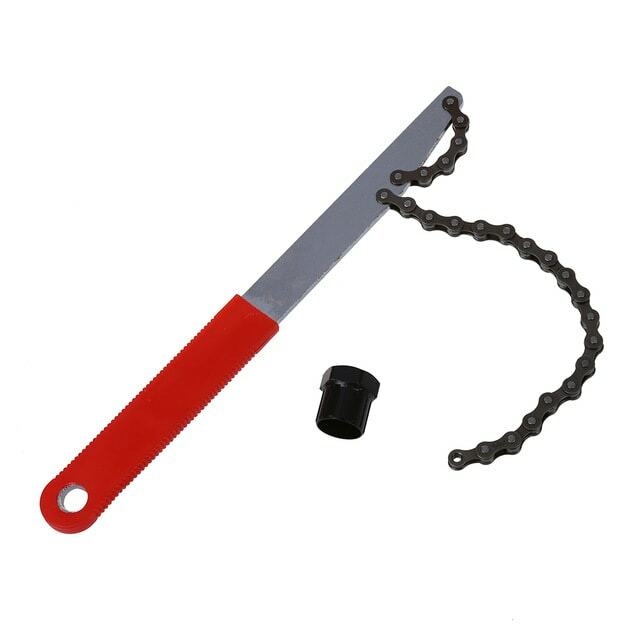 They come in two pieces, a chain whip and cassette lock ring tool to remove the lock ring before you can remove the cassette. They can be used on all types of cassette lock rings from Shimano, SRAM to Campagnolo. This is a simple, yet very useful tool to have at home when you need to change your bike chain. With the chain breaker, you can easily do it at home instead of sending your bike to the shop and save a few bucks for coffee instead. If you ride a lot, you’ll probably require a new chain every 4-5 months, or maybe every 1-2 months if you ride as much miles as the pros do. This is by far the most popular, effective and hassle free chain cleaner around. All you’ll need to do is to run the chain backwards through the cleaner with the chain degreaser inside. There are several mini brushes inside the cleaner which scrub the chain from all 4 directions and you’ll have a clean, shiny chain in less than 2 minutes. Most adjustable wrenches are too thick to fit on the pedal axle to tighten and loosen them. This pedal wrench has a slim profile, measures 11.5” (29cm) long and provides plenty of leverage to remove the tightest of all pedals. It’s useful if you travel a lot with your bike and the bike bag requires the pedals to be removed for packing. 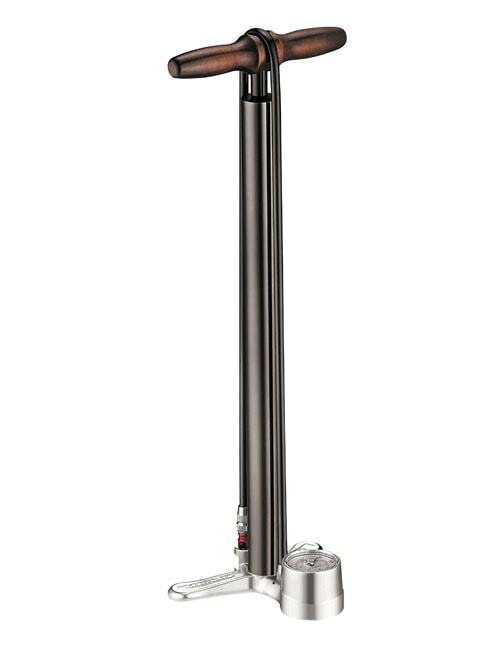 Yhe Lezyne Steel Floor Pump is a solid bike pump which makes pumping up the bike tires easier especially when the tire pressure reaches 5 bar/72psi and beyond. It can go all the way up to 220psi if needed for track bikes. 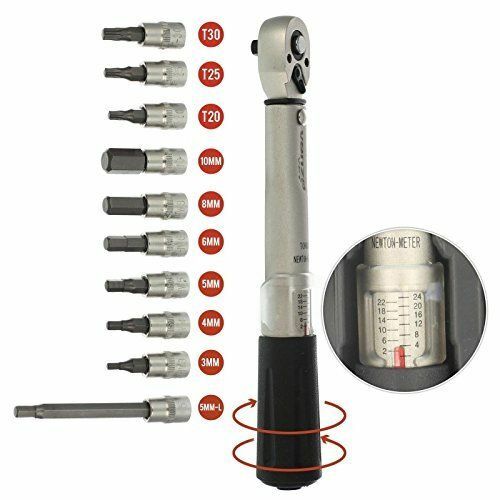 It’s compatible with both Presta and Schrader valves and has very accurate tire pressure gauge reading. A bike work stand for you to easily and securely mount your bike while you’re working on it, whether it’s for washing or maintenance. 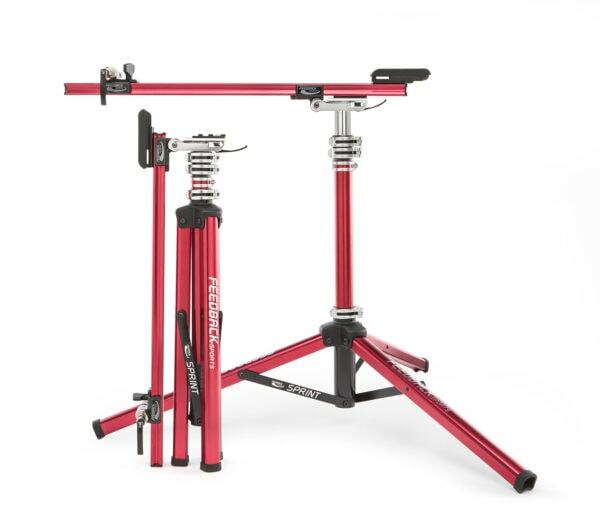 With this work stand, your bike sits on it rather than being clamped on the top tube or seat post which could potentially crack if you’re not careful, especially with carbon. They fit all types of bikes from road bikes to CX, mountain bike and even track bikes. Everyone has different levels of expertise when it comes to bike repairs and maintenance. Your repair tool kit should reflect on your expertise levels. There’s no point buying a whole bunch of tools which you aren’t going to utilise. A good starting point is to find a tool kit that can perform most tasks on your bike. But there is nothing wrong with buying individual tools either. If you realise you’re going to need quite a number of tools, there will be a point where it would be cheaper to buy a tool set rather than individual tools. PRO TIP : Be realistic about what you can and cannot do on your bike. We all know quality tools last a long time but they don’t come cheap. On the flipside, cheaper tools tend to either round off quickly and could damage the bolts and nuts on your bike. If they feel fiddly at the beginning, chances are they’ll get worse after 4-5 times of using it. Have a look at the tool and feel it’s build quality. Then ask yourself is it tough enough to perform the job required overtime. The more often you need to use it, the better quality it needs to be. Sometimes, you can get away with a cheaper and low quality tool for a simple job. PRO TIP : If you’re going to use the tools often, go for the highest quality ones that you can afford.